Spilt milk will probably happen to you at some point unfortunately, it’s inevitable by the fact that it’s such a regular use in and out of the fridge and involve caps and tops coming on and off with the potential for being left off or loose and spilling everywhere. 1. Clear the affected area of items. So the milk carton or bottle is probably the worst culprit now soaked in milk, so carefully remove it making sure that milk does not go everywhere else. Also, check any other items in the fridge, hopefully all nicely stored and packaged and nothing like exposed meats that have been affected by the milk. 2. Do a quick soak-up of excess milk. So maybe just grab kitchen roll or tissues, or a cloth, and simply wipe up any from inside the fridge. Maybe bring a small bag or bin over to throw the tissues in or squeeze the rag out in. 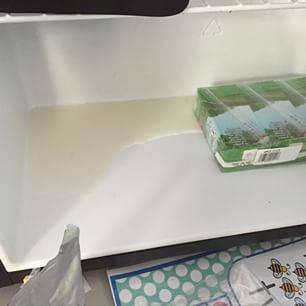 Remember to trace all areas in the fridge the milk may have run to, under shelves or on shelf sliders, in drawers, and right at the bottom. 3. Squeeze a lemon in the fridge. Have a lemon, cut it in half, and squeeze the juices all over the fridge, even over the affected area. This is not actually to clear, but to give a great and natural fresh smell straight away. 4. Do a proper wipe. So get a good damp clean cloth and a suitable general cleaning-spray and squeeze over the area and start wiping nicely up back to as-was condition. Keep rinsing the cloth out, and again get in all the nooks and crannies in the fridge. You’ll probably find other bits of dirt and bits here, so it may be a good excuse to carry on into other areas of the fridge. 5. Place things back. So now the fridge is clean and smelling great, slowly place items back in, taking care to place them carefully in there, and of course making the milk items correctly located and tightened. Remember to check if any items needs a good wipe and clean as you do place them back in, and use the opportunity to place them in better or take out any older items to be thorwn away. For more tips and tricks, contact Easy Cleaners Birmingham and we’ll soon help out.